Whatever the reason is for needing a dental crown, maybe you are thinking of a gold crown for your teeth. There are many benefits to having gold crowns instead of porcelain. You can contact us, and we will provide you with the benefits you are looking for when it comes to getting a gold dental crown instead of porcelain. Here are some advantages gold has over a regular dental crown. Gold dental crowns are a lot stronger than original porcelain dental crowns. They provide you with the strength you need in a crown while also being robust enough to keep surrounding healthy teeth as healthy and vigorous as they need to be for as long as they need to be. They also do not corrode as quickly as other crowns do and keep the crown from wearing away too fast. Most people do not have allergic reactions to gold dental crowns as opposed to porcelain dental crowns. This is good if you have allergic reactions to certain metals. This means anyone can wear a dental crown. Gold dental crowns fit people well. 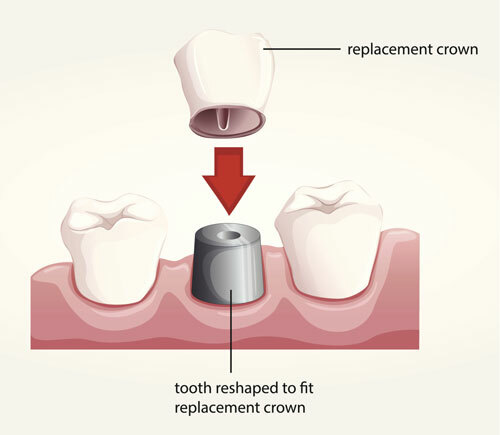 These type of crowns provide people the superior fit they need when it comes to the need for wearing a dental crown. When using a gold dental crown for your tooth repair, less of the tooth need to be trimmed down for the crown. This is one of the best reasons why many people choose gold dental crowns over porcelain. These are some good reasons for choosing gold dental crowns over porcelain. As always, make sure to contact us if you need help with your gold crown or if you have any other questions about getting a crown put in. We are here for you with the answers you need.